Due to the larger scale of the newly acquired NOJA Power Factory at Murarrie a new workplace production system has been implemented in order to significantly improve productivity and workflow. The production line uses a system with elements of Lean Manufacturing and the Kanban concept to control the release of materials into production. 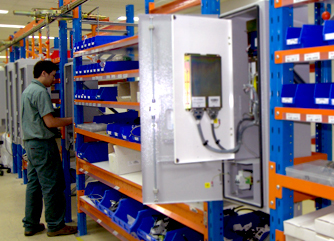 Parts are replenished via a two-bin system in which inventory is carried in two bins. A replenishment quantity is ordered when the first bin is empty and during the replenishment lead time, material is used from the second bin. The idea is to minimise worker movements and thus increase their productivity. Periodic replenishment of the workstation storage areas from the main store, which also runs a two bin Kanban system, ensure that parts flow to production is maintained at all times. The system exhibits a competitive advantage when it comes to speed, accuracy, agility, and low operating costs coupled with lean inventories. Engineering Director, Jay Manne said the idea came about from a review of Lean Manufacturing principles which prompted key production staff to attend a Queensland Manufacturing Institute Training Day to further their knowledge. Mr Manne initiated an analysis of the existing layout in order to improve efficiency and to understand what changes would benefit workflow at our new factory. “Analysis of the existing workspace showed that it was restricted by the shape of the factory and the design of the fixed workstations. Space was cluttered, and as staff ran out of parts, workflow was interrupted. “Surprisingly staff would walk up to two kilometres per day to and from their workstation to the nearby parts storage. 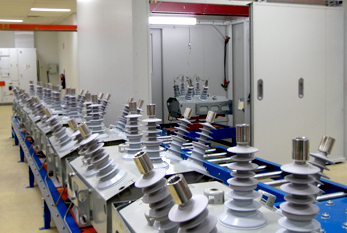 Since we only had one High Voltage test area important R&D testing has potential to interrupt the through flow of production”. Mr Manne said. Mr Manne said the new factory including two high voltage test bays, allow us to make better use of our staff and their time. “System implementation was driven by wanting maximum efficiency out of our existing arrangements. Once we went through the analysis exercise and achieved some improvements it became apparent that we could only go so far with our existing layout.” he said. The new building at 16 Archimedes Place allows assembly of OSM reclosers to customer requirements. The OSM recloser and corresponding RC cubicle feed directly via conveyor arrangements into one of two independent test cages. One of these cages is also accessible by an exterior forklift to allow R&D testing and bulk testing of other production parts. Mr Manne also stressed that a very important reason for the implementation was the direct benefit for our customers. “The improved efficiencies will act to reduce our production lead times resulting in improved delivery times for our customers.” he said. Kan is Japanese for “visual”, Ban is Japanese for “signal”.